The art of medieval India, like the art of medieval Europe, was primarily in the service of religion. The devotee’s spiritual experience was enhanced by meditation inspired by works of art and architecture. Just as the luminous upper chapel of the Sainte Chapelle dazzled and overwhelmed worshipers in France, the looming bronze statues of Shiva and Parvati in, for example, the inner halls of the Meenakshi Temple in Madurai, in south India would have awed a Hindu devotee. 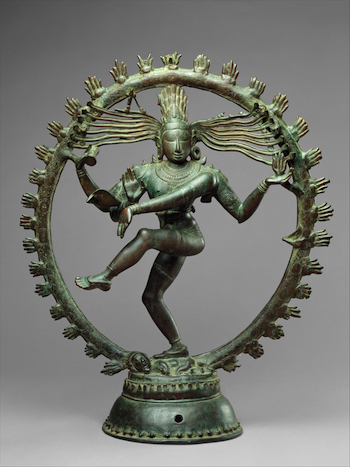 Its important to keep in mind that the bronze Shiva as Lord of the Dance (“Nataraja”—nata meaning dance or performance, and raja meaning king or lord), is a sacred object that has been taken out of its original context—in fact, we don’t even know where this particular sculpture was originally venerated. In the intimate spaces of the Florence and Herbert Irving South Asian Galleries in the Metropolitan Museum of Art, the Shiva Nataraja is surrounded by other metal statues of Hindu gods including the Lords Vishnu, Parvati, and Hanuman. It is easy to become absorbed in the dark quiet of these galleries with its remarkable collection of divine figures, but it is important to remember that this particular statue was intended to be movable, which explains its moderate size and sizeable circular base, ideal for lifting and hoisting onto a shoulder. From the eleventh century and onwards, Hindu devotees carried these statues in processional parades as priests followed chanting prayers and bestowing blessings on people gathered for this purpose. Sometimes the statues would be adorned in resplendent red and green clothes and gold jewelry to denote the glorious human form of the gods. 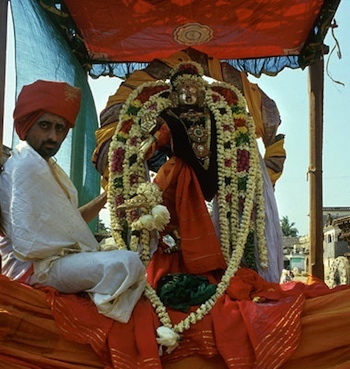 In these processions The Shiva Nataraja may have had its legs wrapped with a white and red cloth, adorned with flowers, and surrounded by candles. In a religious Hindu context, the statue is the literal embodiment of the divine. When the worshiper comes before the statue and begins to pray, faith activates the divine energy inherent in the statue, and at that moment, Shiva is present. Shiva constitutes a part of a powerful triad of divine energy within the cosmos of the Hindu religion. There is Brahma, the benevolent creator of the universe; there is Vishnu, the sagacious preserver; then there is Shiva, the destroyer. “Destroyer” in this sense is not an entirely negative force, but one that is expansive in its impact. In Hindu religious philosophy all things must come to a natural end so they can begin anew, and Shiva is the agent that brings about this end so that a new cycle can begin. The Metropolitan Museum’s Shiva Nataraja was made some time in the eleventh century during the Chola Dynasty (ninth-thirteenth centuries C.E.) in south India, in what is now the state of Tamil Nadu. One of the longest lasting empires of south India, the Chola Dynasty heralded a golden age of exploration, trade, and artistic development. A great area innovation within the arts of the Chola period was in the field of metalwork, particularly in bronze sculpture. 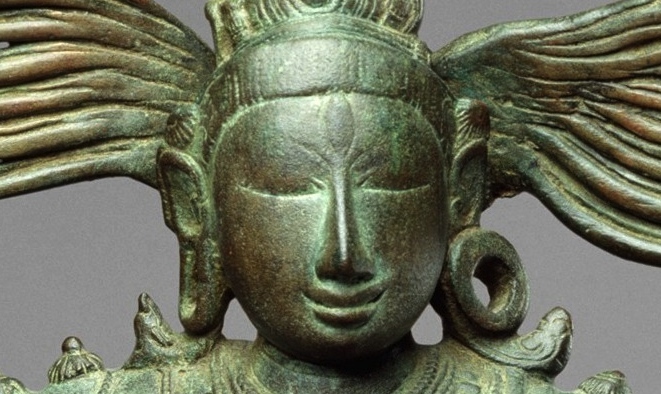 The expanse of the Chola empire stretched south-east towards Sri Lanka and gave the kingdom access to vast copper reserves that enabled the proliferation of bronze work by skilled artisans. During this period a new kind of sculpture is made, one that combines the expressive qualities of stone temple carvings with the rich iconography possible in bronze casting. This image of Shiva is taken from the ancient Indian manual of visual depiction, the Shilpa Shastras (The Science or Rules of Sculpture), which contained a precise set of measurements and shapes for the limbs and proportions of the divine figure. Arms were to be long like stalks of bamboo, faces round like the moon, and eyes shaped like almonds or the leaves of a lotus. The Shastras were a primer on the ideals of beauty and physical perfection within ancient Hindu ideology. Here, Shiva embodies those perfect physical qualities as he is frozen in the moment of his dance within the cosmic circle of fire that is the simultaneous and continuous creation and destruction of the universe. The ring of fire that surrounds the figure is the encapsulated cosmos of mass, time, and space, whose endless cycle of annihilation and regeneration moves in tune to the beat of Shiva’s drum and the rhythm of his steps. In his upper right hand he holds the damaru, the drum whose beats syncopate the act of creation and the passage of time. 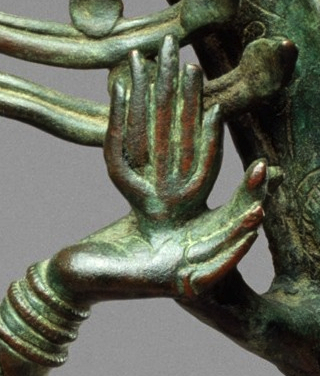 Shiva’s lower left hand stretches diagonally across his chest with his palm facing down towards his raised left foot, which signifies spiritual grace and fulfillment through meditation and mastery over one’s baser appetites. In his upper left hand he holds the agni (image left), the flame of destruction that annihilates all that the sound of the damaru has drummed into existence. 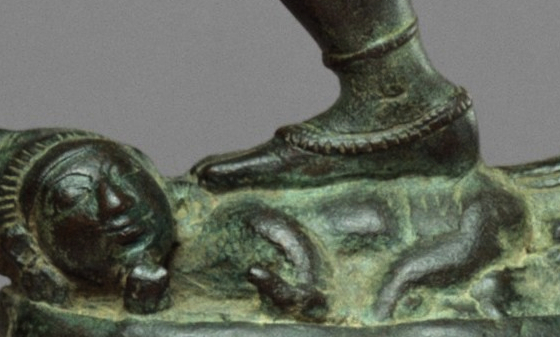 Shiva’s right foot stands upon the huddled dwarf, the demon Apasmara, the embodiment of ignorance. The eloquent bronze statue of the Shiva Nataraja, despite the impact of its formal beauty on Rodin who knew little of its background, is incomplete without an understanding of its symbolism and religious significance. 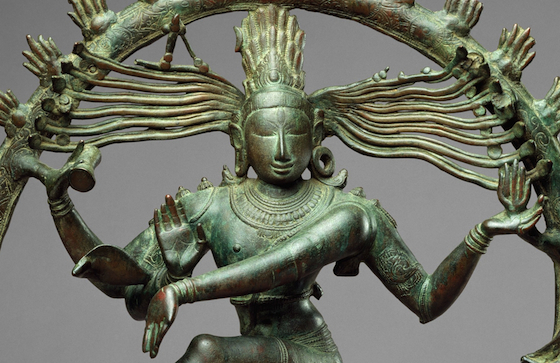 Bronzes of the Chola period such as Shiva as Lord of the Dance (Nataraja) arose out of a need to transmute the divine into a physical embodiment of beauty. Cite this page as: Farisa Khalid, "Shiva as Lord of the Dance (Nataraja)," in Smarthistory, August 9, 2015, accessed April 21, 2019, https://smarthistory.org/shiva-as-lord-of-the-dance-nataraja/.